PHÚ THỌ — Signs of cracking, subsiding and leaking water have been found on 16 irrigation reservoirs in northern Phú Thọ Province, falling short of safety standards during rainy reason. The reservoirs are Cây Quýt, Rôm, Ðát Dội, Ðầm Gai, Vỡ, Núi Ðẫu, Nhà Giặc, Chòi, Ðá Ðen, Trằm Cạn, Vinh Lại, Trầm Sắt and Ba Gạc. The provincial Irrigation Division said they were degraded as they were all built 3-4 decades ago. 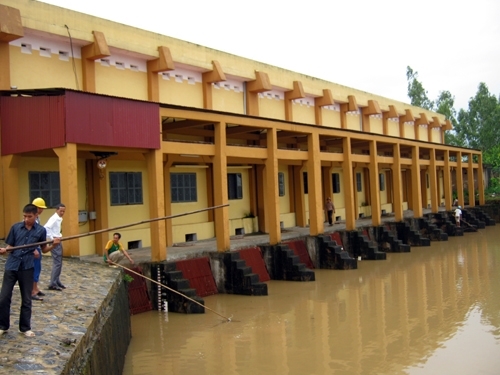 A lack of funds to repair and upgrade the reservoirs was another problem, the division said. The division’s statistics revealed that no reservoir in the province was equipped with devices to observe and measure meteorological data. This resulted in inaccuracy of data and difficulties in controlling water levels in the reservoirs, the division said. Lâm Việt Tuấn, head of the division, said the division made plans to minimise risks caused by degraded reservoirs during the rainy season. Senior experts were told to be ready to take action in emergencies. The division also proposed the provincial People’s Committee allocate funds for repairing and upgrading the reservoirs. Nguyễn Văn Lợi, director of the State-backed Phú Thọ Irrigation Work Exploitation One Member Co Ltd – the company assigned to operate all irrigation works in the province, told Phú Thọ newspaper that it attempted to fix damaged reservoirs step by step. From early this year, the company began assessing the degradation of local reservoirs. After the assessment, it repaired six damaged reservoirs with money from the provincial Natural Disaster Prevention and Control’s funds, he said. The company also assigned teams on duty 24 hours a day at each irrigation works to ensure safety during the rainy season, he said.